We’re partnering with business and marketing solution providers to deepen and expand the value they deliver to their clients. Companies of every size want to make marketing more efficient and effective; by adding Domino Decisions to their product and service portfolios, our channel partners are able to address those needs for their clients. To learn more about how your organization can become a Domino Decisions channel partner, please contact us today. We partner with best-in-class technology providers to ensure our solution is both scalable and secure. Domino Decisions is hosted in an SSAE-16, SOC2 type 2, and SOC3 compliant data center to meet the most stringent security requirements. We continue to add strategic technology partners that help advance our platform and provide enterprise class performance, security and controls. If you are interested in joining our technology partner program, please contact us today. Konica Minolta Business Solutions U.S.A., Inc. is a leader in information management focused on enterprise content, technology optimization and cloud services. 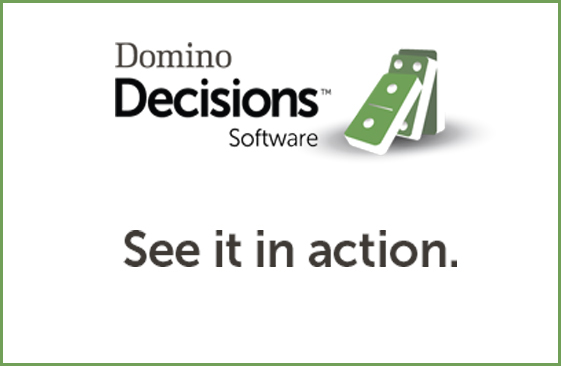 Domino Decisions is part of a portfolio of solutions to improve speed to market, manage technology costs, and facilitate the sharing of information to increase productivity. 39 Ideas Consulting develops strategies and implementation plans that focus our clients on the right marketing activities to accomplish their business goals.